It was right there on the cover of the 1990 Visitors’ Guide to P.E.I. : a photo of one of the Island’s most picturesque, and most controversial, views. It was land at Cousin’s Shore, where the Irishtown Road comes down from Kensington and meets Highway 20, and it would cause a scandal when it was sold to a developer only a few years later. While looking at the 2007 Visitors’ Guide, David Sisam, a Toronto architect who has a cottage on P.E.I., noticed a particular ad. It was a photo of the same land at Cousin’s Shore. Sisam is one of many people on P.E.I. who say the government should have taken action long ago to make sure the Island’s coastal landscape isn’t destroyed by cottage subdivisions. But this isn’t exactly a new concern. As historian Harry Baglole points out, P.E.I.’s governance has been marked by the land issue ever since the province was founded. “Land issues and Island politics have always gone together, hand in glove,” said Baglole. In the 19th century, Island settlers waged a long and difficult struggle against their absentee landlords back in Britain. Though they eventually won out and gained ownership of their farms, Island farmers remember the past and are still suspicious of the public telling them how to use their land, said Baglole. “Pushing for enlightened land use policy in P.E.I. comes up against the same entrenched conservative instincts as pushing for gun control legislation in the United States,” he said. He may be a cottager himself, with a summer home near Malpeque since 1988, but he’s passionate about the P.E.I. land issue. “People aren’t noticing, and slowly but surely (the coast) will end up like New Jersey if something isn’t done,” he said. Despite a series of commissions, roundtables and reports dating back to the first Royal Commission on the Land in 1973, government has failed to create planning strategies to deal with the steady tide of development, says Sisam. It’s that lack of vision that frustrates Jack Saunders, manager of the P.E.I. provincial planning branch. He and his staff are supposed to set policy for land use but he said they don’t do much of it. “We don’t have a plan of any sort that tells you ahead of time what you might expect to do. Land uses are established at the time of subdivisions,” he said. The provincial government approves subdivision lots for most of the province, but Charlottetown, Summerside and 29 of about 75 Island municipalities have their own land use plans. The Lands Protection Act of 1982 states that non-residents who want to own more than five acres of total land, or more than 165 feet of shore frontage, must receive permission from the Executive Council (the premier and his cabinet). The Island Regulatory and Appeals Commission (IRAC) is responsible for examining the applications from non-residents and sends its recommendations to the provincial government. But almost all of the non-resident applications get approved year after year. “I could put in a tire-recycling plant or an organic farming outfit or . . . there’s just no control. There’s no zoning,” said Saunders. Being a planner on P.E.I. is a frustrating job, he said. The issue of individual versus collective rights is at the very heart of land use in this province. With no rules on development, people can do whatever they want, says Sisam. With the way farming has been going, farmers on P.E.I. are keener than ever to sell their land, says John Cousins, a farmer in Park Corner. “We’re like the Piping Plover. We’re a dying breed,” said Cousins, who’s also on the board of the Lucy Maud Montgomery Land Trust.The trust’s mandate is to preserve the scenic agricultural land along P.E.I.’s North Shore by finding alternatives to development. Cousins sold the development rights to part of his land to the land trust, so he could keep farming it. The land trust has bought the development rights to about 130 acres of land between French River and Sea View. But the price of land has been steadily rising and the trust is having trouble raising enough money to buy development rights. If buying five acres of land or less, the average price per acre for all types of land nearly tripled between 1994, when the land trust was founded, and 2004. It rose from about $16,500 to about $43,000.The trust has been petitioning the provincial and federal governments for support. The previous Conservative government all but ignored the land use issue, said Saunders. The new Liberal government says they are now stepping up to the plate. The government will appoint a new Commissioner on Land Use and Local Governance before the end of the summer, said Carolyn Bertram, minister of communities, cultural affairs and labour. The commissioner will also examine previous studies and strategies on land use and will present a report in 2009, she said. It could be a breath of fresh air for a province that virtually ignored a 604-page report from the 1990 Royal Commission on the Land, said Douglas Boylan. Boylan was the chair of the commission, which spent two years researching land issues before giving 232 recommendations to the government. When that report came out the people of P.E.I. were ready for government to take action, he said. 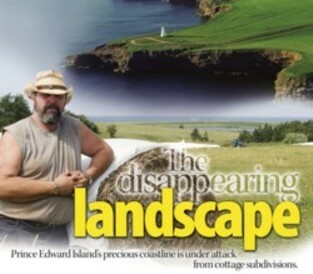 Boylan suspects that people still care about the land issue but that after the new commissioner is done his work, they “will expect a game plan.” Among the many observations and statistics in the 1990 commission report, Boylan and his team pointed out that there were thousands of cottage lots being created on P.E.I. that weren’t being built on. From 1973 to 1987, 3,500 more cottage lots were created than building permits issued, which suggests that there are more subdivisions going up than there is demand for cottages, says Sisam. The number of cottages within view of his own, he said, has gone from five to 15 in the past 20 years. A quick drive around the P.E.I. countryside makes it obvious how fast cottages are going up. “It’s almost scary,” said Boylan, who questions whether tourists still value the unspoiled vistas that P.E.I. offers. Cousins sees more cottages every year but thinks tourists do come here to see the scenery and the land. He said he’s come to realize how precious his land is. This entry was posted on July 19, 2008 at 1:13 pm and is filed under Media, Raising Awareness. You can follow any responses to this entry through the RSS 2.0 feed. You can leave a response, or trackback from your own site.